First official record: entered into the Stationers' Register by John Busby on 18 January 1602 as "A booke called An excellent and pleasant conceited commedie of Sir John Faulstof and the merry wyves of Windesor." 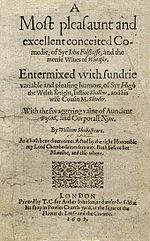 First published: version of the play published in quarto in 1602 as A most pleasaunt and excellent conceited Comedie, of Syr John Falstaffe, and the merrie Wives of Windsor. Entermixed with sundrie variable and pleasing humours, of Syr Hugh the Welch knight, Justice Shallow, and his wise cousin M. Slender. With the swaggering vaine of Auncient Pistoll, and Corporall Nym (printed by Thomas Creede for Arthur Johnson). This text was republished in 1619 as part of William Jaggard's "False Folio" (printed by Thomas Pavier). Additional information (publication): the 1602 quarto text has traditionally been considered a bad quarto, and was one of the original texts in relation to which Alfred W. Pollard coined the term. The quarto text is 1620 lines, compared to the 2729 line Folio text. 4.1, 5.1, 5.2, 5.3, 5.4 and much of 5.5 are absent from Q1, 3.4 and 3.5 are transposed and numerous speeches within individual scenes are also transposed. In his 1910 edition of the quarto text, W.W. Greg wrote "my own study of Merry Wives has led me to doubt whether any limit can be set to the possible perversion which a text may suffer at the hands of a reporter." However, more recent editions of the play, such as David Crane's 1997 edition for the New Cambridge Shakespeare and Giorgio Melchiori's 2000 edition for the third series of the Arden Shakespeare, have questioned the likelihood of memorial reconstruction being wholly responsible for the text, arguing for a more complex provenance. First recorded performance: on 4 November 1604, in the banqueting hall of Whitehall Palace, performed by the King's Men for Charles I. Evidence: writing in 1702, John Dennis claimed Shakespeare wrote the play in fourteen days at the behest of Queen Elizabeth. In 1709, Nicholas Rowe claimed Elizabeth commissioned Shakespeare to write the play, because she liked the character of Falstaff so much in 1 Henry IV that she wanted to see him in love. Neither claim is given much weight by scholars today. The composition of the play definitely postdates the Oldcastle controversy concerning 1 Henry IV, as the character is, and seemingly, always was, called Falstaff in Merry Wives. One area examined by scholars in an effort to date the composition of the play is where in the plot of the Henriad the narrative of Merry Wives is supposed to take place. 1 Henry IV was definitely written by early 1597. Henry V was completed by September 1599. 2 Henry IV was written at some point between these two. Exactly where Merry Wives fits into the sequence is unknown, but attempts to date the composition of the play by locating the plot within the overall Henriad have proved fruitless. The plot of Merry Wives does not fit into the plot of the Henriad in any chronological or logical sense; there are continuity problems no matter where in the sequence one locates the play. For example, Falstaff and Mistress Quickly don't know one another at the start of Merry Wives, whereas in 1 Henry IV, they have known one another for over thirty years. John Jowett, editor of the play for the Oxford Shakespeare: Complete Works, argues it is not supposed to fit into the Henriad at all, it is "essentially an Elizabethan comedy, the only one that Shakespeare set firmly in England. The play is full of details that would have been familiar to Elizabethan Londoners, and the language is colloquial and up to date." Textual evidence and topical allusions led John Leslie Hotson to argue the play was specifically commissioned for a performance on Saint George's Day (23 April) 1597, as part of the celebrations for the Garter Feast (an annual meeting of the Order of the Garter). Hotson believes the play was commissioned for the Feast by George Carey, 2nd Baron Hunsdon, who had recently succeeded his father as patron of Shakespeare's Lord Chamberlain's Men and was to be one of the newly elected knights. Hotson contends the play was his contribution to the festivities. If one accepts this theory, it suggests that Shakespeare interrupted his composition of 2 Henry IV to hastily compose Merry Wives after Hunsdon's commission. This is important because traditionally, Merry Wives has been dated c.1600, a date supported by verse analysis. However, verse makes up very little of the play, and if Shakespeare was writing extremely fast, the reliability of the test would be compromised. Scholars who accept the theory that Shakespeare stopped writing 2 Henry IV to write Merry Wives theorise that he did so somewhere between 3.2 and 4.2.